Live text commentary on the BBC Sport website and audio commentary on BBC Radio 5 live. Chelsea's Ashley Cole is set to win his 100th international cap after being named in England manager Roy Hodgson's squad to face Brazil on 6 February. 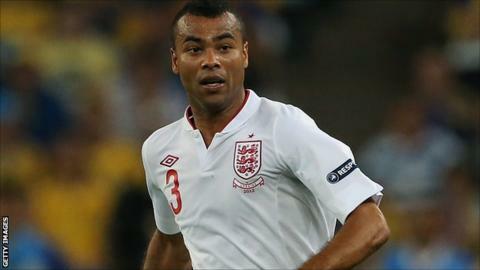 Left-back Cole, who made his England debut against Albania on 28 March 2001, has been named in a 24-man squad. Fellow Chelsea team mate Frank Lampard has been picked, as has Jack Wilshere, Michael Carrick, Tom Cleverley, Leon Osman and skipper Steven Gerrard. The most notable exclusion was Tottenham's Scott Parker. Parker is now fit again after returning from Euro 2012 with an Achilles injury, but Hodgson has deemed he is not yet ready to return to the International set up. As expected youngsters Raheem Sterling, Jonjo Shelvey and Wilfried Zaha are all excluded and instead named in the Under-21 squad to face Sweden on 5 February, while Hodgson has taken the unusual step of naming only two goalkeepers - Joe Hart and sought-after Birmingham youngster Jack Butland. Manchester United defender Chris Smalling is called up for the first time during Hodgson's tenure after recovering from injury, but his team mate Phil Jones is omitted from the senior squad and named in Stuart Pearce's Under-21 set up. Jermain Defoe has also been included despite his current pelvic problem, joining Manchester United duo Wayne Rooney and Danny Welbeck, plus Liverpool new-boy Daniel Sturridge, in attack. Cole would become only the seventh player to have reached 100 caps for England, joining Gerrard, Billy Wright, Bobby Charlton, Bobby Moore, David Beckham and Peter Shilton. England squad to face Brazil: Jack Butland, Joe Hart, Leighton Baines, Gary Cahill, Ashley Cole, Phil Jagielka, Glen Johnson, Joleon Lescott, Chris Smalling, Kyle Walker, Michael Carrick, Tom Cleverley, Steven Gerrard, Frank Lampard, Aaron Lennon, James Milner, Leon Osman, Alex Oxlade-Chamberlain, Theo Walcott, Jack Wilshere, Jermain Defoe, Wayne Rooney, Daniel Sturridge, Daniel Welbeck. England Under-21 squad to face Sweden: Ben Amos (Manchester United), Declan Rudd (Norwich City), Jason Steele (Middlesbrough), Ryan Bennett (Norwich City), Nathaniel Clyne (Southampton), Craig Dawson (Bolton Wanderers - loan from West Brom), Phil Jones (Manchester United), Tom Lees (Leeds United), Jack Robinson (Liverpool), Luke Shaw (Southampton), Adam Smith (Millwall - loan from Tottenham Hotspur), Andre Wisdom (Liverpool), Nat Chalobah (Watford - loan from Chelsea), Jordan Henderson (Liverpool), Will Hughes (Derby County), Henri Lansbury (Nottingham Forest), Jason Lowe (Blackburn Rovers), Josh McEachran (Middlesbrough - loan from Chelsea), Jonjo Shelvey (Liverpool), Raheem Sterling (Liverpool), Benik Afobe (Bolton Wanderers - loan from Arsenal), Tom Ince (Blackpool), Connor Wickham (Sunderland), Wilfred Zaha (Crystal Palace - loan from Manchester United).